AUD 14,870 Excl. Duties / Taxes. This Heart diamond is 2.22 carat in weight, and comes with Excellent polish and Very Good symmetry, as verified from an independent gemological laboratory. The diamond is graded I in colour, and has a clarity grade of SI1. The diamond's AGS grading report number is 104096635001, which will detail further its specifications and measurements, and will also come with the purchase of the stone. AUD 1,425 Excl. Duties / Taxes. This Heart diamond is 0.58 carat in weight, and comes with Very Good polish and Good symmetry, as verified from an independent gemological laboratory. The diamond is graded D in colour, and has a clarity grade of SI2. The diamond's AGS grading report number is 104082660002, which will detail further its specifications and measurements, and will also come with the purchase of the stone. AUD 9,432 Excl. Duties / Taxes. This Heart diamond is 1.51 carat in weight, and comes with Excellent polish and Very Good symmetry, as verified from an independent gemological laboratory. The diamond is graded E in colour, and has a clarity grade of SI2. The diamond's AGS grading report number is 104087351004, which will detail further its specifications and measurements, and will also come with the purchase of the stone. 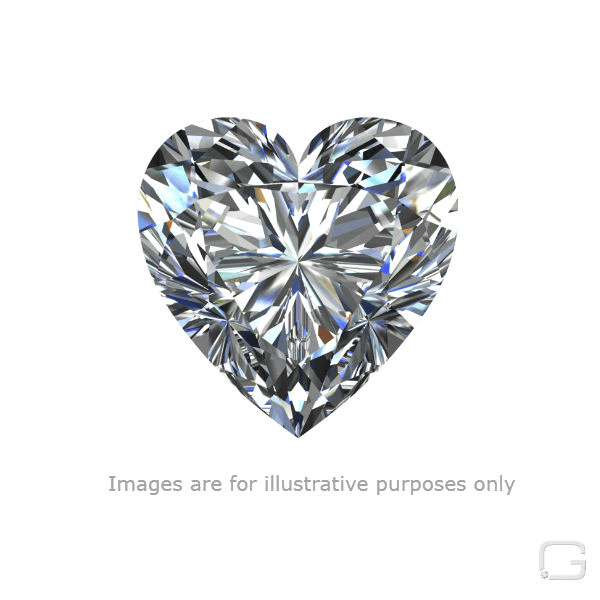 This Heart diamond is 1.05 carat in weight, and comes with Good polish and Good symmetry, as verified from an independent gemological laboratory. The diamond is graded H in colour, and has a clarity grade of SI2. The diamond's AGS grading report number is 104103677002, which will detail further its specifications and measurements, and will also come with the purchase of the stone. AUD 18,482 Excl. Duties / Taxes. This Heart diamond is 2.5 carat in weight, and comes with Very Good polish and Very Good symmetry, as verified from an independent gemological laboratory. The diamond is graded G in colour, and has a clarity grade of SI2. The diamond's AGS grading report number is 104102976004, which will detail further its specifications and measurements, and will also come with the purchase of the stone. This Heart diamond is 1.02 carat in weight, and comes with Very Good polish and Very Good symmetry, as verified from an independent gemological laboratory. The diamond is graded G in colour, and has a clarity grade of SI2. The diamond's AGS grading report number is 104078126003, which will detail further its specifications and measurements, and will also come with the purchase of the stone.